Wing span: 1 1/2 - 2 5/8 inches (3.9 - 6.6 cm). Identification: Both sexes with conspicuous pink wing edges. 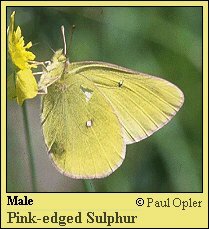 Male yellow; female yellow or white (very rarely). Upperside of male with black border; border on female may be incomplete or only seen at tip of wing. Underside of hindwing clear yellow with single silver cell spot circled in pink. Life history: Males patrol with a slow flight for females. Eggs are laid in midsummer on blueberry leaves, and young caterpillars overwinter. Most feeding occurs the following spring. Caterpillar hosts: Various blueberry plants (Vaccinium species) in the heath family (Ericaceae). Adult food: Nectar from flowers of bristly sarsaparilla and orange hawkweed. Habitat: Shrubby openings in woods, bogs, or scrub areas where Ericaceae grows; often in burned or logged sites. Range: From British Columbia and eastern Oregon east through the Great Lakes area to northern New England. Isolated population in central Appalachians of northeast Pennsylvania, western Maryland, eastern West Virginia, and northwest Virginia. Conservation: Mountain populations of southern Appalachians should be monitored. Management needs: Investigate habitat management needs,if any, in southern Appalachian habitats. .Co., Boston, Mass. 370 pages, 23 color plates.